Who ever thought custom cabinetry could create so much paperwork? I wouldn't. What is it that I actually do? I am not sure and during an insightful teleconference this morning it was brought up that I have some routines that need to be changed. 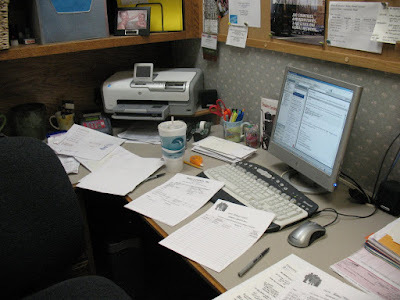 Yes, that would of course be fine with me, as you can see its messy where I work and a little crowded. I actually might put something on my goal list this year that pertains to making my office a little bigger, or possibly blow a hole through the wall so I can not feel like I am in a cave all the time. Either way I might feel better. I think I would feel much better after I can blow something up. I got to visit with a friend/new client today and it was fun. We went over the plans for her new kitchen and talked about everything included in the cabinets, and what she might want to change. That is fun to talk about and exciting for the client. I love to see the excitement when the job is done and they are completely satisfied. That is one of my favorite parts. I have not given up on being able to work out in the shop, I just know its going to take time for Mr. Old-fashioned a.k.a. Mark Weber www.askthecabinetmaker.com . I will have my day in the shop soon enough, and as my husband says; "you won't like it and you will ask to go back to the office!" I don't think so Mr. Know-It-All!